I have fewer photos than last month but hey, It’s my birthday month! To be honest the weekend before my birthday wasn’t ideal. It’s the second week of October and I would like to thank the universe for making up for the cancelled plans. Thank you for making this year’s birthday exceptional! Oh yes, back to the photos. This month’s photos exhibit some of my loves which I’m glad I experienced this September. (1) Food Love. Smores pie from Sebastian’s during my brother-from-another-mother’s birthday dinner. (2) Travel Love. For Omi’s last out of town hurrah, we hit Republic Wakepark in Nuvali (I owe you guys a post about this!). (3) Photography Love. This is birthday treat number 1! I haven’t written about it but birthday treat number 3 is seen below, check out the 8th photo. (4) Film Love. If you have a chance to catch “Ang Nawawala”, you should! I highly recommend the movie especially if you are a huge fan of Filipino Music. 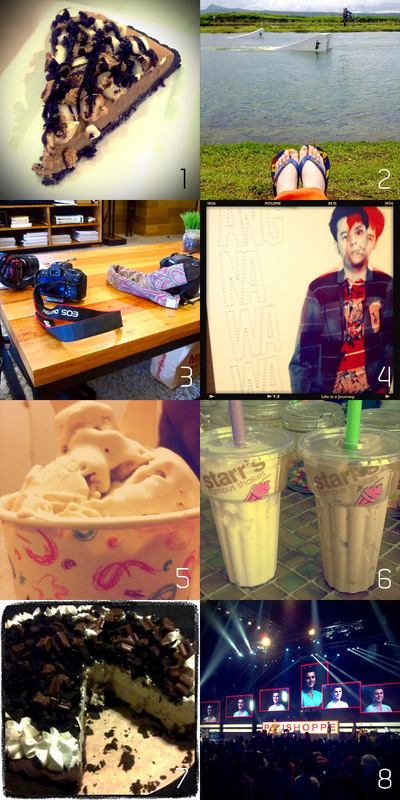 (5) Food Love. Oh yeah, it’s another ice cream post. (6) Steady Love. On my actual birthday Owee and I bought a couple of shakes and literally talked under a tree. Steady times, me likey. (7) Chocolate Love. Chocnut Pie for my birthday! Yaaaayyy! (8) Birthday Treat Number 3 = Zac Efron. October has been mondo busy but I hope to post more photos again! Don’t forget to follow me on Molome!